The Edubuntu team has been discussing the need of a tool to filter the list of applications displayed to a user depending on various criterias. We first implemented it as a set of meta-packages called application bundles and prefixed ubuntu-edu-* though we then noticed that it doesn't always apply to all countries. Each country and possibly region/school district has its own rules on what kind of software should be available to which grades. In order to fix that, the following specification has been written and will be discussing the development of a tool used to easily create new menus that will be put on top of the main Edubuntu menu and filter it. The interface will basically let the administrator define new menus by selecting the entries he wants and these he doesn't, then create new menus/sub-menus and finally save that as a standard XDG menu file. Then, another interface will be used to assign menus to system groups. A way to easily import and export these menus will also be provided along with a package providing sample menus provided by some of our partners (Guadalinex, Qimo, Revolution Linux, ...). 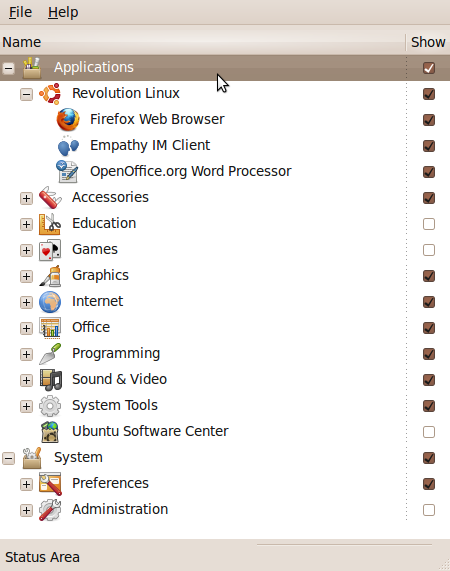 The Edubuntu project has introduced a new tool called the "Edubuntu menu editor" that allows administrators to easily define new menus and use them to filter the list of application a user can see. 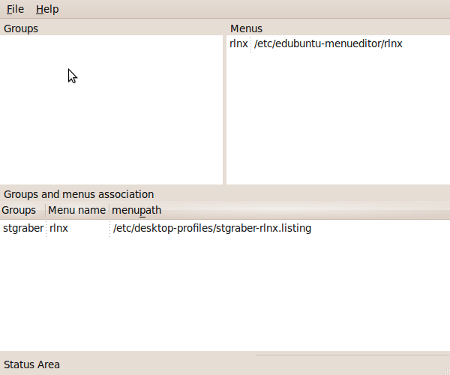 The matching is done using groups and menus can easily be imported and exported. This new functionality is available from the menu and profile editors under System Administration menu. A company providing Edubuntu support to a school district in Spain is required to have very specific menu entries and in a specific order. A large school with many software applications installed would want different menu entries to appear depending on which grade the students are in. A large company using LTSP wants to display different menu entries based on whether employes are in a design, administration, accounting or engineering group.